Bar bending schedule (or schedule of bars) is a list of reinforcement bars for a given reinforced concrete work item, and is presented in a tabular form for easy visual reference. 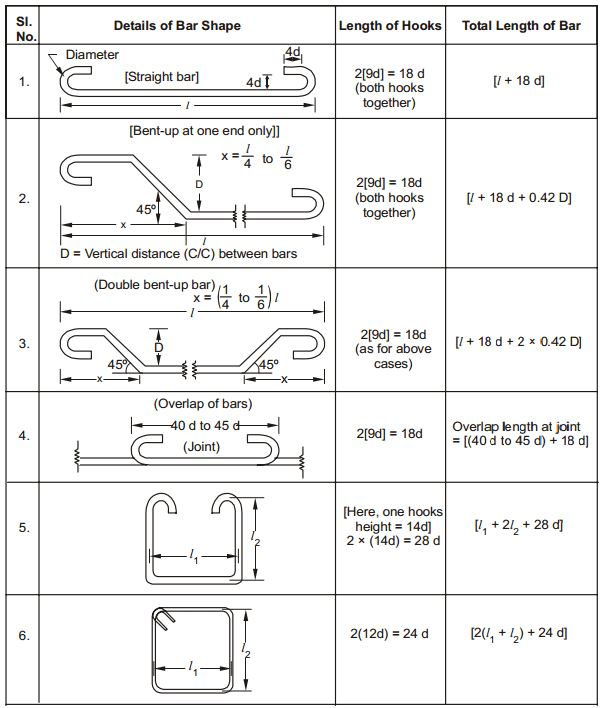 Table of bar bending schedule summarizes all the needed particulars of bars – diameter, shape of bending, length of each bent and straight portions, angles of bending, total length of each bar, and number of each type of bar. This information is a great help in preparing an estimate of quantities. (a) Length of one hook = (4d ) + [(4d+ d )] – where, (4d+ d ) refers to the curved portion = 9d. 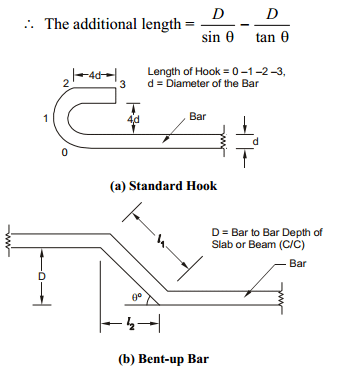 Figure 2 presents the procedure to arrive at the length of hooks and the total length of a given steel reinforcement. Bar bending schedule provides details of reinforcement cutting and bending length. Advantages of bar bending schedule is when used along with reinforcement detailed drawing improves the quality of construction, cost and time saving for concrete construction works. 1. When Bar bending schedule is available, cutting and bending of reinforcement can be done at factory and transported to site. This increases faster execution at site and reduces construction time and cost due to less requirement of workers for bar bending. Bar bending also avoids the wastage of steel reinforcement (5 to 10%) and thus saves project cost. 2. Using bar bending schedule for when used for Fe500, it saves 10% more steel reinforcement compared to fe415. 3. It improves the quality control at site as reinforcement is provided as per bar bending schedule which is prepared using the provisions of respective detailing standard codes. 4. It provides the better estimation of reinforcement steel requirement for each and every structural member which can be used to compute overall reinforcement requirement for entire project. 5. It provides better stock management for reinforcement. Steel requirement for next phase of construction can be estimated with accuracy and procurement can be done. This prevents stocking of extra steel reinforcement at site for longer time, preventing corrosion of reinforcement in case of coastal areas. It also prevents shortage of reinforcement for ongoing work by accurate estimation and thus concrete construction works can proceed smoothly. 6. Bar bending schedule is very much useful during auditing of reinforcement and provides checks on theft and pilferage. 7. Bar bending schedule can be used for reinforcement cutting, bending and making skeleton of structural member before it can be placed at the required position. Other activities such as excavation, PCC etc can proceed parallel with this activity. So, overall project activity management becomes easy and reduces time of construction. It becomes helpful in preventing any damages due to construction time overrun. 8. It provides benchmarks for quantity and quality requirements for reinforcement and concrete works. 9. Bar bending schedule provides the steel quantity requirement much accurately and thus provides an option to optimize the design in case of cost overrun. 10. It becomes easy for site engineers to verify and approve the bar bending and cutting length during inspection before placement of concrete with the use of bar bending schedule and helps in better quality control. 11. It enables easy and fast preparation of bills of construction works for clients and contractors. 12. The quantity of reinforcement to be used is calculated using engineering formulas and standard codes, so there is no option for approximate estimation of steel reinforcement. 13. With the use of bar bending schedule, mechanization of cutting and bending of reinforcement can be done, again reducing the cost and time of project and dependency on skilled labor requirement. It also improves the reliability on accuracy of bar cutting and bending. 14. When mechanized bar cutting and bending is used, the cost of reinforced concrete work per unit reduces and helps in cost optimization of construction project. What is Rebaring Technique in Reinforced Concrete Construction?